This piece, which was developed in Iowa and at the Hollywood Fringe Festival last year, is the story of identical twin sisters, one of whom is disabled, living in Berlin during the growing turmoil of Nazi Germany. Playwright Janet Schlapkohl, whose mother was an identical twin and whose grandmother emigrated from Germany, was struck by the plight of the disabled in Nazi Germany, where they were often killed, sterilized or otherwise maltreated. 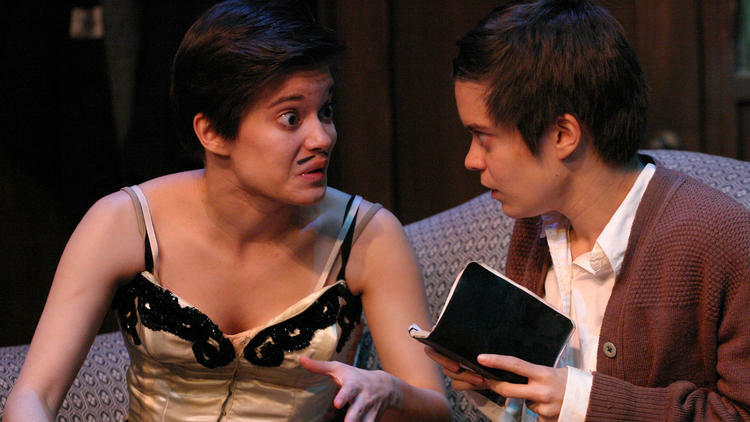 As an adjunct professor at the University of Iowa, Schlapkohl got to know identical twin sisters Elizabeth and Emily Hinkler, who were undergraduates in the theater department, and decided to write a play for them. What emerged was the story of Magda (Emily Hinkler), the outgoing and energetic sister, and Matilde (Elizabeth Hinkler), the disabled twin who is more cerebral than her sister and writes the sketches that Magda performs nightly in the Berlin cabarets. While the play deals with the fate of the disabled under the Nazis, the heart of the story is the relationship between the two sisters. Their bond is forged in iron, and their different circumstances do little to impact the vibrant, often contentious dynamic between them. But it is clear that nothing - not the Nazi regime, not their desperate poverty and not Matilde's disability - could ever break that bond. The performances are excellent. Emily Hinkler plays the extroverted Magda, who is determined to build a future for the sisters - always together. Elizabeth Hinkler plays Matilde, who is more intellectual and introverted, struggles with the injustices the world and dreams big about the possibilities in life. Both actresses are exceptional in their performances and the onstage relationship that they evoke. Casting the twin actresses provides an extra measure of texture and depth to the production. Ron Sossi and Paul David Story skillfully co-direct the piece, and are aided by the set design of Pete Hickock and costume design by Audrey Eisner - both of which add to the texture and reality of pre-war Berlin. While playwright Schlapkohl has deftly expanded the piece from its original sixty-five minutes to ninety-five minutes, the play still feels somewhat incomplete. Nevertheless, this is a moving and emotionally engaging evening of theater.